About six months ago, in one of our articles titled how to convert install.ESD file to install.WIM, we talked about converting ESD (Electronic Software Download) file to WIM file with the help of a third-party tool called WinReducer WIM Converter. 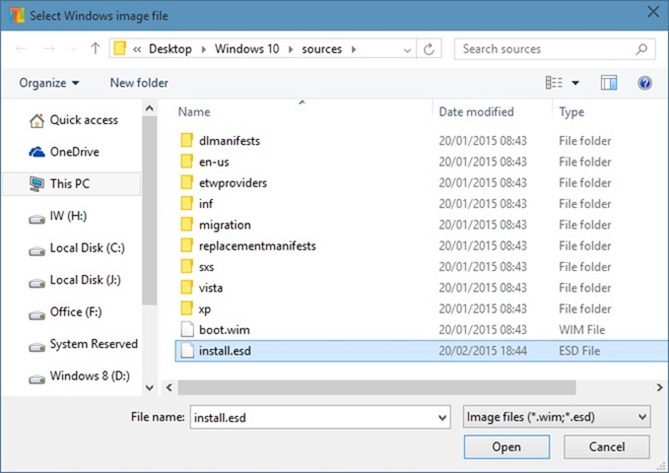 The tool lets you convert files between ESD and WIM with ease. After going through our how to convert install.esd file to WIM guide, many users asked us to publish a guide to convert ESD file to ISO but the lack of an easy-to-use and straight-forward software forced us to wait for the release of an easy-to-use software for the job. 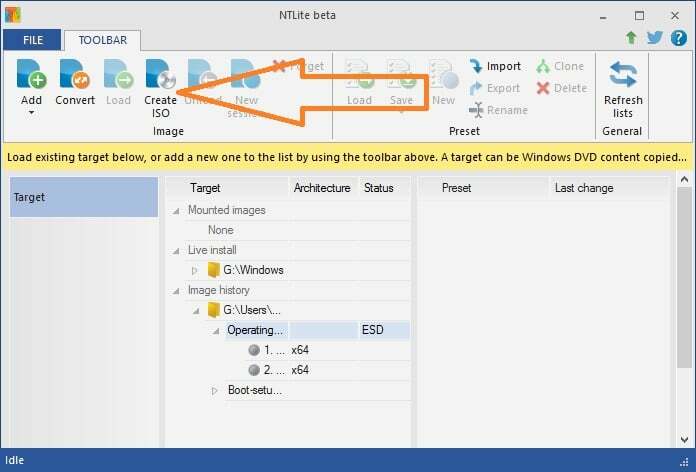 Because only Windows 8 and Windows 10 support installing from ESD files, NTLite displays ESD conversion option only when you load an edition of Windows 8, Windows 8.1, or Windows 10, meaning this option will not appear when you load an edition of Windows 7. Note that NTLite doesn’t support encrypted ESD files. Because of this, if the downloaded ESD file is encrypted, please go through the steps in our Method 2 to decrypt the ESD file before converting the same to ISO. Go for this method if the ESD file is encrypted (Windows 10 ESDs are encrypted), as the below mentioned method (Method 2) doesn’t support encrypted ESD files. This method can be used to convert both encrypted and decrypted ESD files to ISO. Step 1: The first step is to download ESD Decrypter tool from here. Extract the .7z file to a new folder to get DISM and Decrypt.cmd folders. 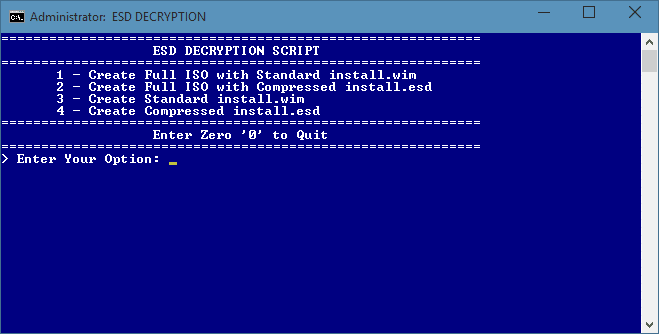 Step 2: Now, copy the ESD file to this new folder containing extracted files from the ESD Decrypter. Step 3: Right-click on the Decrypt.cmd file and then click Run as administrator option to run the same with admin rights. Click Yes button when you see the User Account Control box. Step 4: Finally, press 1 on you keyboard and then press Enter key to begin creating the ISO file. Note that read all options carefully as the options might change in future versions. Your new ISO image file of Windows 10 should be ready in about 20 minutes and will vary on your system resources as well as selected Windows 10 ESD file size. The new ISO file will be available under the same folder containing the extracted contents of the ESD Decrypter. UPDATE: If you’re trying to create ISO of Windows 10 RTM or later, please follow the instructions in Method 1 (scroll up to see). In order to convert ESD image to ISO, please complete the following instructions. 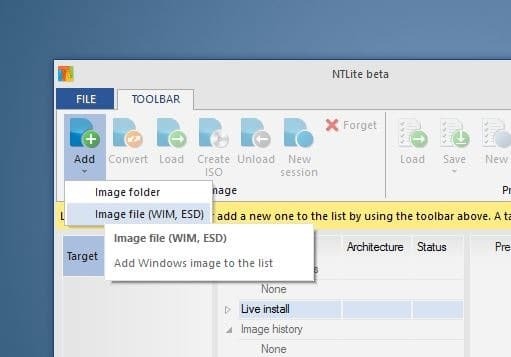 Step 1: The first step is to download and install NTLite on your PC. As you likely know, NTLite is available in both free and paid versions. If you can’t afford the paid version, go ahead and download the free version as it supports converting ESD image files. Installing NTLite is a straight-forward job and should not take more than a minute. 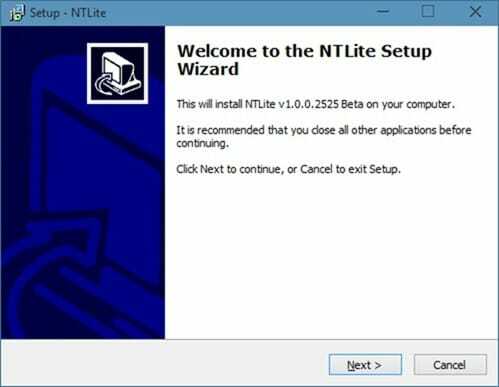 You can run NTLite on both x64 and x86 versions of Windows 7, Windows 8, Windows 8.1, and Windows 10. 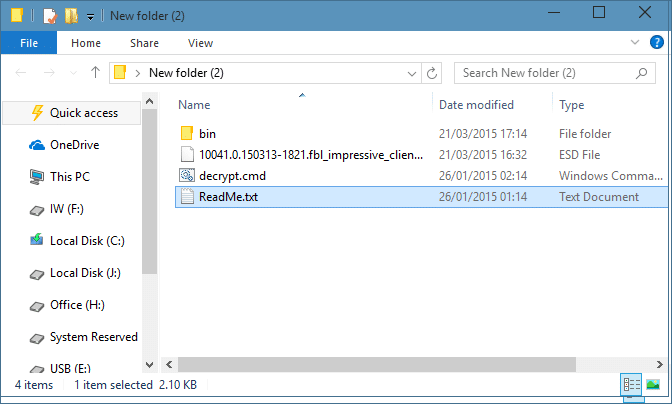 Step 2: It’s time to unpack your Windows 8 or Windows 10 ISO image to a folder. You can use file archiving utilities such as WinRAR, 7-Zip (free) or WinZip if you are on Windows 7 as it doesn’t include native support for ISO image files. After installing one of these file archiving utilities, you just need to right-click on the ISO file and then select appropriate options to extract the contents of the ISO file. 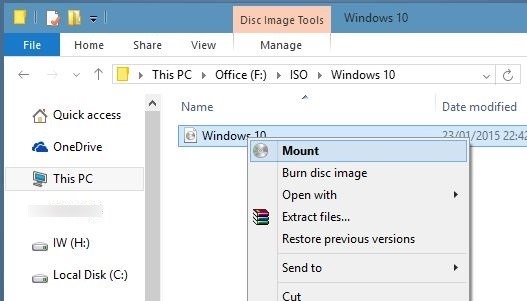 Both Windows 8 and Windows 10 support mounting ISO image files out of the box and you can copy the contents of ISO file without the help of third-party utilities. 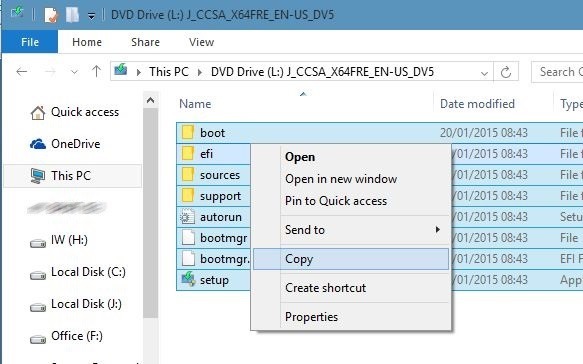 In Windows 8 and Windows 10, right-click on the ISO file, click Mount option, and then copy all files from the newly mounted drive in This PC to a new folder. Step 3: Launch NTLite software. Click the small down arrow button below the Add button, click Image file (WIM, ESD) option, browse to the ESD file and then click Open button. Step 4: Now, select the Windows version and edition (see picture) to activate Create ISO button. Note that if the Create ISO is greyed out and not allowing you to click, please click or select the Operating system (which appears under Image History). NOTE: If the Create ISO button is greyed out even after selecting the version as shown in the below picture, it’s likely because the ESD file is encrypted. The current version of NTLite doesn’t support encrypted ESD file. Please refer to the Method 2 to decrypt the ESD file and create the ISO file. 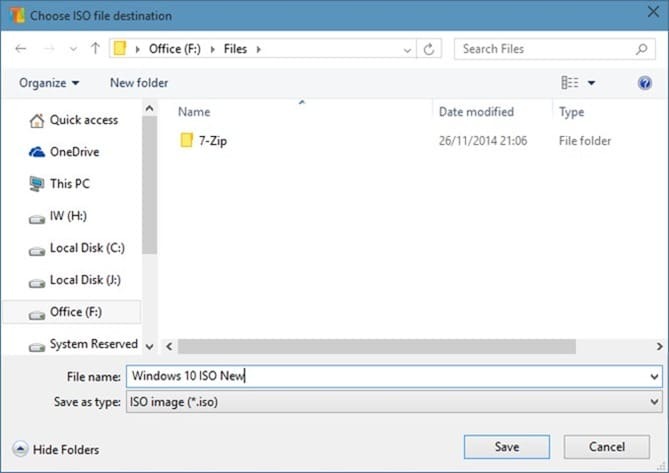 Step 5: Finally, click Create ISO button (see above picture), select a location to save your new ISO file, and then click Save button to begin the converting the ESD file to ISO. The time required to convert the file mainly depends on your PC configuration and the size of the ESD file. Once the ISO image is ready, you can either burn the ISO image to a DVD or create a bootable USB to install Windows from USB drive. To convert files between ESD and WIM, please follow the above mentioned instructions. The only change is that, after browsing to the ESD file and selecting Windows version, you need to click the Convert button. If there is a better tool or way to convert ESD file to ISO do let us in comments. Do let us know if you are experiencing any issues while converting your ESD file to ISO. Found this solution which doesn’t require you to download anything to convert an ESD file to WIM file. Determine the Index number to modify. Export the image to a WIM file. You now have an install.wim file alongside the install.esd. Thank you. It worked well with build 17134 using ESD Decrypter. I just downloaded the latest Windows 10 (10548? ?, or is it better to say build 1511?). I tried ESD Decrypter 6, which DOES NOT WORK! It seems bent on expecting 4 images in the .esd file, while the latest download only has TWO! Is there an updated version of ESD Decrypter that doesn’t care how many images are in the file? inside the .esd file, it cannot decrypt it. I just downloaded the decryptor into the same folder I put the .esd file. Hope it all works, Thanks for your help. Windows 10 x86-32/x86-64 ISO Page . Creates download links right from Microsoft. I have updated the post with link to the version of ESD Decrypter that supports build 10240. Kindly download it again and you will have no issues. I just tried v6.7 with RTM build 10240 and can confirm that it works without any issues. Not working with Windows 10 RTM Build 10240 I get a RSA error. Step 2 of your instructions talk about ISO image whereas it should be ESD image. The free program esd-decrypter-wimlib-4.7z does not work either. With respect, perhaps you could link to downloading an ISO image. Thanks for trying though. Unfortunatly the latest build, 10061, does not work with ESD Decrypter – it ggives an RSA error. First of all, thanks for your inputs. I have edited your comment to remove the link referring to the Microsoft site as I have already linked to the same URL in the guide. Also, I have updated my guide to include instructions to convert the encrypted ESD to ISO using the method mentioned at the Microsoft community. I just have updated the post with another method to decrypt the ESD file first and then convert the ESD file to ISO. Please follow the instructions in Method 2. Odd Austrud, I was running in to the same issues and then I found this guide and was able to convert the ESD to an iso. I just had to make sure to put the ESD file in the esd-decrypter-wimlib-4 folder (the same folder as decrypt.cmd) for it to work. Ok. It looks like the released 10041 ESD images are encrypted. NTLite, as of now, doesn’t support encrypted ESD files. So you need to first decrypt the downloaded ESD file using some other tools before using NTLite to create the ISO out of it. I am working on it and will come up with a solution soon. I have the exact same problem. No matter what line I select the Convert to ISO stays grayed out. Odd, as I have pointed out in the Step 4 of the article (just edited to add that line), you need to click on the operating system or version of Windows. Please check the picture provided in teh step 4 of the article. Sorry for the confusion. Thanks for this guide. I have, however a problem with this. I downloaded the lates Win10 Preview build 10041, as an ESD file. I want to convert this to an .iso file. I do exatctly as you say above, but the ‘Create ISO Image’ button stays greyed out, no matter what I do. Do you have any suggestions?